She’s a schoolmarm with integrity, but in truth, she’s a liar and a murderer. He’s a Bounty Hunter, naturally suspicious, especially when it comes to the new schoolteacher. To escape the danger of a ruthless man, Lenora Whitfield boards a westerly bound train disguised as a man. She can’t believe her luck changes when an opportunity arises. She takes on the identity of a school teacher moving to Silver Sage Creek, Texas, but there’s one problem, the opportunity comes with a baby. Can she pull it off? Can she become a lady, a schoolmarm, and a mother? One lie leads to another causing her to doubt herself, especially when the suspicious bounty hunter takes a liking to her. Can she keep up a life of lies? How can Ethan Langdon fall for a beautiful liar? Unable to keep his emotions from deepening, he discovers another lie. He’s frightened for her when the web of lies lead her to the hanging rope. With her half-breed son and her abdomen growing with child, returning to the white man society is a struggle, even with the Ranger’s help. 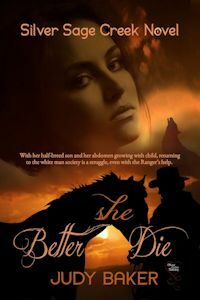 In 1858, Clare Rose Coulson of Silver Sage Creek, Texas, is traumatized as a band of Apache Indians murder her husband, her father, and best friend. When kidnapped, she tries to escape only to be captured by another band, but quickly learns this band is Comanche and different. They aren't warriors or savages, but a peaceful, loving people. While living with the band, she learns to respect the Indian ways and settles into a life she never dreamed. Four years later, Captain Drury Burchett, a Texas Ranger, rescues Clare Rose. Only, the beautiful redheaded woman is angered by her rescue. He's bewildered by the compassion she shows for the Comanches, especially since his hatred for the savages digs deep into his soul for all they've taken from him. What makes this woman so strong in her beliefs and needs to defend the Indians? Ruby Thornton, the proprietor of the Silver Sage Saloon is a business woman, not a prostitute. 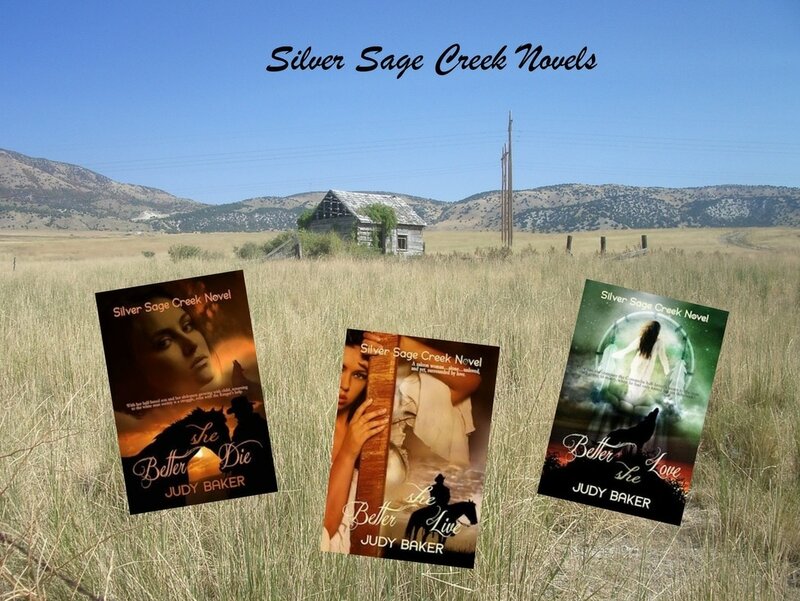 But, because she runs a saloon, the proper folks of Silver Sage Creek treat her as such, until the wealthy Richard Webster moves into town. His reputation of being a gentleman and a lucrative railroad businessman has the entire town smitten, including Ruby. When a cowboy named Jesse Stryker comes along working for the wealthy Webster, Ruby is torn by her conflicting emotions. His angry eyes contradict his proposition for a night of pleasure. She’s tempted. Only, she isn’t a prostitute. Ruby’s first instincts about a person is usually right, until now. Who’s the shrewd and fiendish man, the wealthy Webster or Stryker? Caught up in a charmed life, Ruby’s backed into a corner of kidnapping and murder, putting her life and others in danger. Who can she trust? ​How can she compare the Comanche half-breed’s kisses to the man she’s going to marry, when he had only kissed her on the cheek? Dr. Millicent’s family never spoke the word love. When she travels to a quaint western town in Texas, and within a few days, she hears the word often from a father she never knew, and a mother she thought dead. After a short time on the ranch, she has doubts about returning to her life in Atlanta? How can she give in to her grandmother’s demands, go back, and marry someone she doesn’t love? When Sam Coulson meets the high society, prim and proper doctor, he doesn’t think she can fit into the rude, crude and untamed life of the west. But, a vision of her saving him, and her stubborn independence, draws him in until she owns his heart. 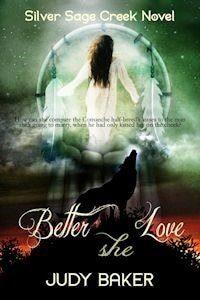 Can a kiss, a flashflood rescue, a shooting, and a mad rabid wolf, chase her into the arms of a Comanche half-breed, and convince her she belongs with him?